NL2200 is commonly used in agricultural, construction, and mining applications for water, light sludge, effluents or other liquids where chemical and "external" abrasion resistance is required (not designed for potable water or transfer of foodstuffs). 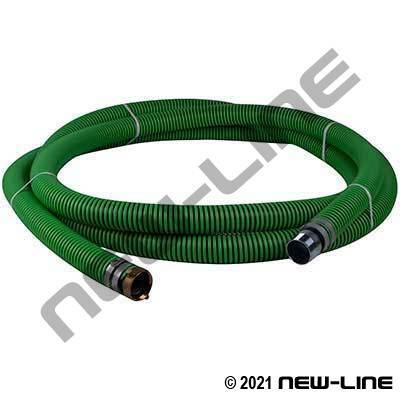 It is a popular septic tank cleaning hose because it is lightweight, flexible, and very easily handled (even at low temperatures) and is typically not designed for abrasive transfer. Its unique polyethylene helix reduces dragging friction and permits the hose to be maneuvered on the ground easily. We also offer the NL2205 K-Series brand for users who prefer a higher quality option. It is formulated/constructed differently for added flexibility, wider temperature range, and better performance characteristics in certain applications. You can tell them apart by the tube (NL2200 is solid black tube while the NL2205 has a black/green tube). It is also available in Blue/Black (NL2210), Red/Black (NL2212), or Yellow/Black (NL2214). Construction: Tube: Smooth Black EPDM. Cover: Slightly corrugated green polyethylene helix with black EPDM between.